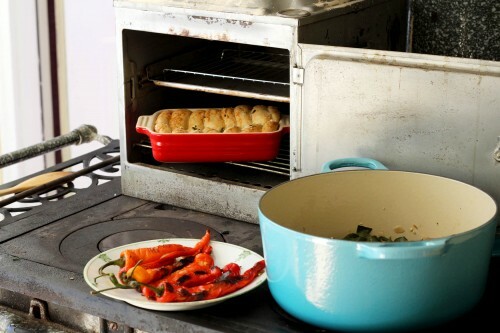 After learning about how to chose, restore, and maintain a vintage stove, we made collards and chow-chow, cheese stuffed ember grilled peppers, corn pone with sorghum syrup and herb rolls baked in a vintage portable stove-top oven. The stove-top oven was a big hit. That’s what I want to chat about. 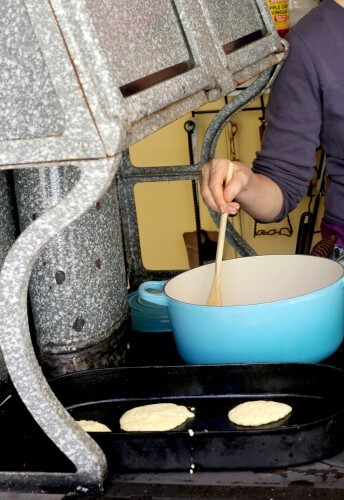 I adore my portable Everhot stove (first photo above) that I found in an antique store years ago for $15. These stoves were designed to fit over the burners of ovenless oil stoves in the early 20th century. You could stick this little insulated two-shelf gizmo over a burner … et voila … baked ham and sweet potatoes at your service. Do we need electricity??? NO! 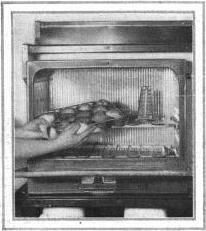 Good Housekeeping magazine published an article in 1922 called “Portable Ovens, their Pros and Cons“. Oh dear me, I just love it. Pretty much, the trusty Good Housekeeping “Institute” was monkeying around with air flow and trying to figure out scientifically where you should bake what in these ovens and at what temperature. 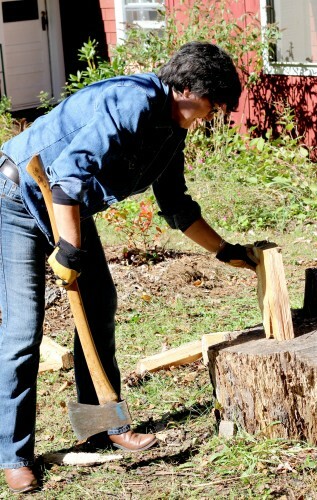 Sort of what you have to do in order to cook with a wood cookstove, so it all goes together. Bottom line? Says the Institure, “A portable oven of the type illustrated here has a definite place in the equipment of practically every kitchen. ” So I recommend you take heed and go out and find you one. Easier said than done, you’ll need to do some searching around on places like ebay and etsy. Don’t bother with a rusted model, go ahead and splurge on one that’s in good shape. Mine came with racks and shelves and has only minor rusting. And the dandy thermometer on top works! Sort of, it will tell you how hot the top of the oven is anyway. 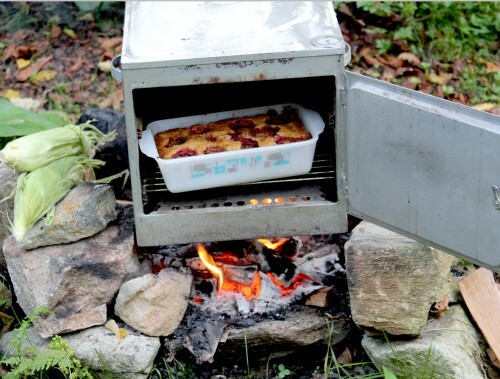 My little Everhot will bake a cake over a campfire, an electric burner, and the wood cookstove. Probably an outdoor grill would be good too. Gas, ummmm. Not sure about that because where would it vent? Speaking of which, I saw a 1950’s collapsible Coleman portable stove designed to use with their gas stoves in an thrift store last weekend, and they’re easy to find, only they’re not insulated. And, perchance if anyone out there has one of these you’d like to sell or knows of a good source, I’ve got buyers! Great! How about a little description and the price and if you have a website, where people can contact you. Otherwise send the info to me and I can point folks to you. Thanks for that link, Bill! I bought a beautiful stove top oven at an antique store to use with my wood cookstove, got it home, and looked at it closely. I am afraid it is insulated with asbestos. I have never dared to use it.